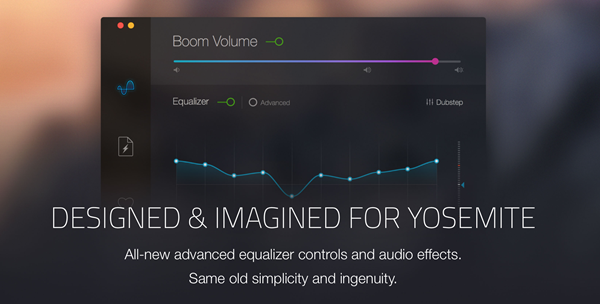 If you’re a Mac user getting to grips with Apple’s latest OS X Yosemite operating system, who also happens to listen to a lot of music, watch a lot of streaming media or just love browsing sites like YouTube, then configuring the Mac’s sound output with Boom 2 could be the smartest thing you would do today. A large number of Mac owners who have found themselves less than impressed with the native sound quality of their Mac will already be familiar with the original Boom software from GlobalDelight. The first iteration of the Boom series managed to collect a loyal following due to the fact that it did a fairly impressive job of noticeably improving the outputted sound quality on a range of Macs. Boom 2 is the evolution of that original product, bringing with it additional power and functionality crafted specifically with Apple’s OS X Yosemite in mind. The good news is that the same core functionality still exists within Boom 2. Installing the app, and allowing it to configure automatically, will provide a system-wide audio upgrade on your Mac, resulting in noticeably improved audio quality. The similarities with the original iteration of the product end there. GlobalDelight has taken things even further to not only make your Mac audio louder, cleaner and crisper, but have also introduced customizable features such as advanced equalizers, intricate frequency controls and multiple audio effects. All of which can be altered by the end-user with minimal fuss. Considering users are slowly being brainwashed into thinking mobile and desktop applications and utilities are throw-away purchases, there will undoubtedly be those who think the $14.99 price-tag is steep. However, considering the software has been lovingly crafted to perfectly fit in with the look and feel of OS X Yosemite and extended to be fully customizable, it seems like a steal. Plus, the developers also offer a free seven day trial directly from their website. You can download Boom 2 by pointing your browser to the following link: globaldelight.com/boom/ and remember, be sure to go for the trial first before parting with your cash, because there’s a chance you’re living with a busted speaker unit in your Mac which even software mightn’t be able to fix. LOL, trial ? 14.99 for a full version? No thanks. I need my own money, thanks. @This site is giving about $900 daily. You can just do this simple task daily from home and have more time with friends & family; Its the most-financialy rewarding I’ve had. It sounds unbelievable. Its best site that i found till now. This article isn’t entirely accurate. Louder music ≠ better sound quality. If you think that’s true, then the “loudness war” would’ve yielded us better sounding music where the opposite was actually true. It helps to know how audio actually works. Want to improve your sound quality? Get better speakers and an external amp + DAC. I totally agree. This past summer I experimented with the Vallhalla headphone amp from Schiit (I kid you not, that’s some good Schiit) paired with the DAC from the Fiio E7. It sounded great, so I went a step further & got ALO Audio’s Pan Am which is both a tube amp & 24bit DAC. I can’t be happier with the results. The overall clarity, and depthless bass are truly impressive. I mostly listen to Spotify premium at high resolution & am hearing songs again as if it were the first time. The problem is that you don’t get anywhere near the resolution out of a Mac’s headphone jack (16 bit, I think?) so for an overall better experience, you need to source the music from the USB port. Once you’ve done this, you’ll never want to directly plug into your Mac again. I’m selling two unused licenses for $10 each. Email ourcore@ymail.com. This app is totally worth it. I usually go for pirated apps, but for the price and the difference it makes…totally justified and quality app. Unlike every other software maker, they are not including even the most recent v1 purchasers in a free upgrade. Very bad consumer practice. have you found a way to increase the mac volume?